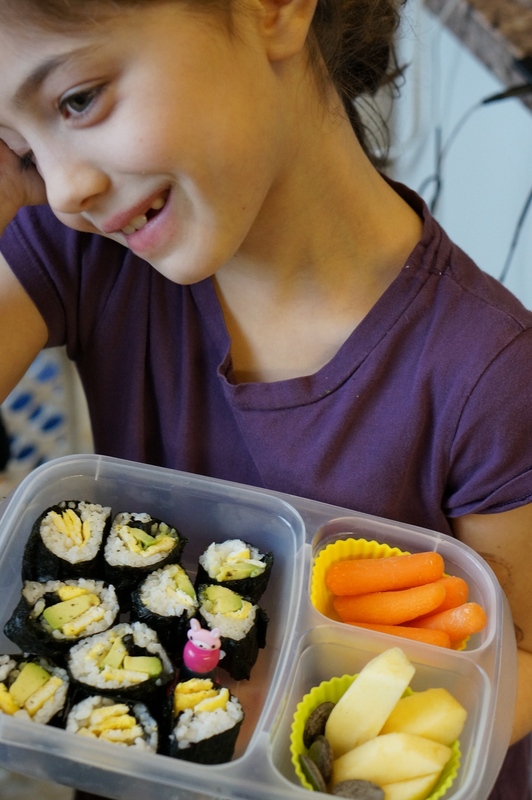 Let me put this right out there: DIY sushi rolls with the kiddos is a lunch that packs itself. I've always been fascinated by sushi: the art of it, the buzz around it, the quest for the freshest fish, the accoutrements. I'm not able to indulge in any of it thanks to my fish allergy and I rarely take chances in a sushi restaurant with the non-fish items because even the slightest bit of cross contamination leads me to Benadryl. A couple of years ago, when we discovered that my eldest daughter didn't have the allergies that I have (phew! ), she and my husband began a sweet tradition of going out for sushi as a twosome. At some point, a second tradition emerged and we began making vegetarian rolls of our own at home. 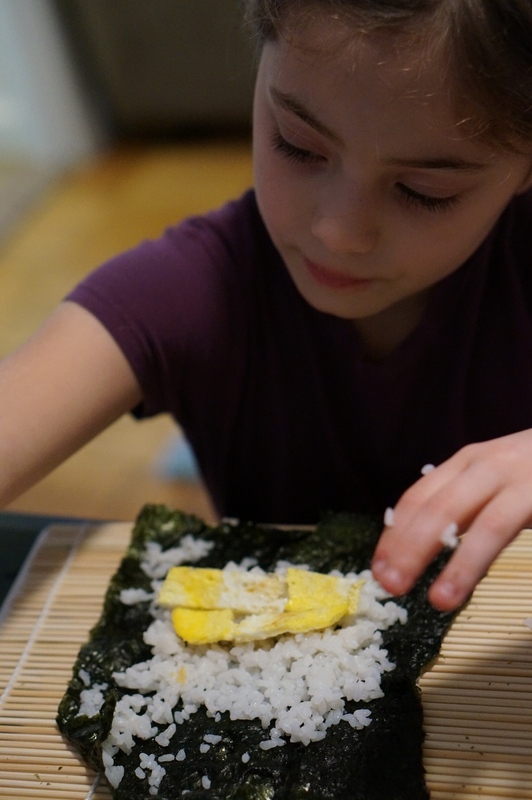 My daughter (then in kindergarten) was completely enthralled by the DIY rolls and all things with seaweed. Her love affair waned for a long while but now it seems to be back. She and I went to the market together the other day and she specifically requested sushi rice and nori. I wasn't at all surprised to see it on her LaLa Lunchbox meal plan this week and was kind of excited for this lunch-making activity. Making sushi rolls is one of those things that sounds involved. And messy. And hard. But I swear, it isn't. I was really feeling victorious about the whole thing until I realized that my littlest one was systematically removing all of the folded clothes from her dresser drawer as we were DIYing with nori. That was big fun. But I digress. These sushi rolls really are an easy project to do with kids and you can basically put anything you want in them. We chose to fill them with egg and avocado. I explained it to my 3.5 year old sushi newbie like this: "First, we're making rice. Second, we're frying two eggs. Third, we're slicing an avocado. Then it's all about the rolling." Bam! It really is that straightforward. My kids overstuffed the rolls in their excitement, of course, and my son was a little taken aback by just how sticky the rice was on his fingers. But they were both proud as peacocks about these rolls, and completely excited to pack them in their lunchboxes. Two rolls, sliced into pieces, fit perfectly into an Easy Lunchboxes container – woot! Bring 1 cup of sushi rice and 1.5 cups of water to a boil. Cover and simmer for about 20 minutes or until the water has evaporated completely. Add 2 tablespoons of rice vinegar (unsweetened) and stir. Prepare the sushi rice and set aside. Lay a piece of nori on a mat and sprinkle lightly with water. My son likened it to rain drops. Spread the rice evenly on the nori, making sure to leave room on the edges (about 1/2 inch, plus more at the top for sealing). Place the avocado slices and egg pieces along the bottom edge of the rice and roll up the nori like a burrito. Seal the edges with wet fingertips. Slice with a sharp knife and enjoy! Makes about 6 rolls. See that cute little pink bunny thing below? It's a teeny container for soy sauce!